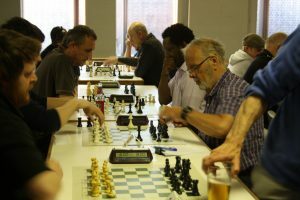 Last night saw 20 members playing in the club’s 4th Annual (time & point) Handicap Event over 5 chaotic rounds of fun, and competitive chess. With handicaps of up to 2.5 pts being added to players scores over the 5 rounds, it was anyone’s guess who would emerge as the winner. 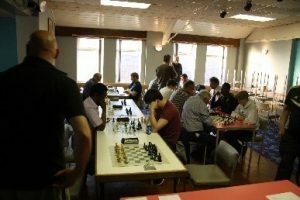 The 2017 champion Rich Wiltshir was brutally handicapped by the contoller’s decision to allow just 4 minutes to complete his games, while other players had between 5 and 15 minutes spread into bands of approx 10 grading points. Round 1 went according to plan with the exception of youngest player Charlie Dodd winning against the grades to perform the “upset of the competition” and put himself in pole position with his handicap for several rounds. Round 2 saw the greatest amount of upsets with all top three seeds being turned over including the 2017 champ. 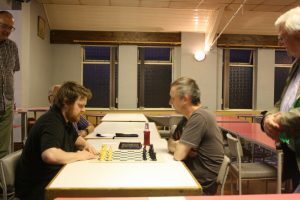 Round 3 saw the cream of the competition rising to the top as Rick Renegade and Julian Bulbeck became the only players with 100% records, whiles father and son duo Neville and Simon played out a draw to remain unbeaten and stay in contention with the leaders. Round 4’s top board game between the two 100%-ers turned out in favour of Rick, but with handicaps left both players on 4 pts. Also on 4 pts were Simon & Neville, while another junior Harry Gardiner took the lead on 4.5 pts with the 1.5 pts handicap after his 3rd win in a row. Newcomers Mike Keenan and Reinhold also won their first games as they started to get familiar with the harsh realities of blitz-type times. With another couple of players having combined scores of 3.5 pts there were 8 contenders who could win the event. The top board in round 5 gave Harry the chance to win the competition outright if he could beat 100% Rick. A superb effort by young Harry just fell short as Rick won with just seconds remaining. Meanwhile on board 2, Julian managed to overcome Neville’s tactics to ensure a joint lead with 5 pts and a play-off with Rick. Four players finished joint 3rd on 4.5 pts; these were Doug Barnett, Simon, Nigel Gardiner and Harry. Am armageddon play-off then took place with Julian winning the toss and electing to have black in the hope of achieving a draw. Rick as white was given an extra minute to his alloted time of 6 minutes, with Julian having his allotted 9 minutes. 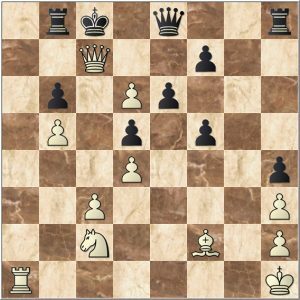 A fantastic game developed as Julian won a piece for a pawn on the king-side while Rick went for the jugular against the queen-side castled black position. 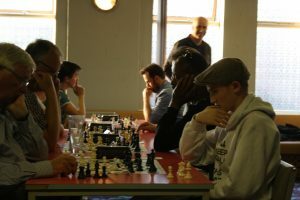 With considerable skill, Rick engineered a break through and cutting off his opponent’s king side escape managed to mate with queen and pawns as the black king was forced towards the centre of the board, while time was running low and a material deficit. Approx 12 spectators watched the final and all agreed it was a high quality game to finish off the competition. Congratulations to Rick on becoming our 4th different winner of the handicap and well played to Julian. Rest assured that Rick can expect a near impossible task of retaining it next year as the controller will impose a tough handicap and time allocation ! Photos emailed to Dave, Dave and Les today. Another hugely entertaining evening. Thanks everyone, and congratulations to both Rick and Julian for a well-focused battle to round the evening off.